The company has four weeks of rehearsals in one of the beautiful studios at BAC, two in preparation for the Harkness Dance Festival performances, followed by two weeks of a video project with the work "Portal" that premieres in the Festival. Cornfield Dance is honored to be participating in the Harkness Dance Festival, focused this year to be part of the 2019 global celebration of Merce Cunningham’s birth. Ellen is gratified to have the opportunity to share this very special moment with New York audiences, presenting a program of her choreography created over the past five years. The company is being supported for these performances by Baryshnikov Art Center Rehearsal and Video Project Residency. Cornfield Dance will be presenting two repertory works along with the premier of a new piece titled “Portal.” Each of these dances defines its own world, and the beautiful and expansive Buttenwieser Hall at the 92nd Street Y provides a delightful and unique container in which they will be seen. Although Cornfield has been working as a choreographer for sometime now, the process of creating dances continues to surprise her, thrill her, challenge her, and invariably stimulate her into new territories of artistic and personal growth. She can think of no better way to celebrate Merce’s lifetime of masterful creation, and to express her love and gratitude for all the ways he changed her life, than to continue creating her own truth, as witnessed in these three dances. Cornfield Dance performed an adapted version of Ellen's newest work Close-Up throughout three of the Center's gallery spaces. 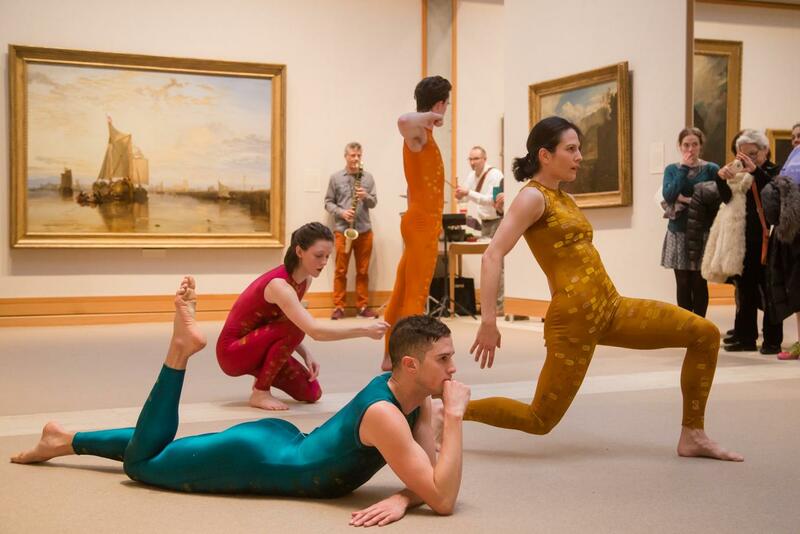 The physical shapes of selected art in the Center's collection were incorporated into portions of the dance language, bringing the viewers "close-up" and intimate with the performers, the museum, and the artwork. Ellen Cornfield and Alan Good co-taught a one-week workshop for the Cunningham Trust at New York City Center teaching material from Torse by Merce Cunningham with two showings performed on Friday, November 17th at 3:00pm and 4:30pm. Cornfield Dance company members Pierre Guilbault, Ruth Howard, Vanessa Knouse, Logan Pedon, and Joshua Tuason premiered Ellen Cornfield's newest work, Close-Up at the West End Theatre as part of the Soaking WET Series. Cornfield Dance performed in a shared showcase produced by The Construction Company and The Performance Project at University Settlement. Dancers Pierre Guilbault, Ruth Howard, Vanessa Knouse and Logan Pedon presented Raw Footage (2008) and a section from Pas de Detour (2015). Ellen staged a 15-minute version of Pas de Detour on the Rutgers University dance department, assisted by her company dancers. The piece was performed by eight dancers as part of the university's DancePlus Fall show. Cornfield Dance met with nine international presenters who came to view excerpts of Cornfield Dance's repertory: Small Stages, Pas de Detour and Raw Footage. Dancers Joshua Tuason and Vanessa Knouse performed a duet from Small Stages at the LUNGS Harvest Arts Festival in the Lower East Side. Two-week Repertory Workshop of Ellen’s Pas de Detour, which included daily technique classes.